Goal-Setting! Select & Reflect! Engaging Students in Their Own Learning! 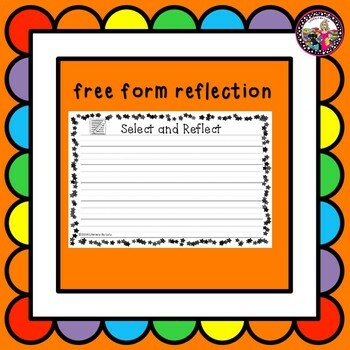 These forms are the perfect way to get kids to stop, think, and reflect on their classwork. This can be used with any assignment in any subject. 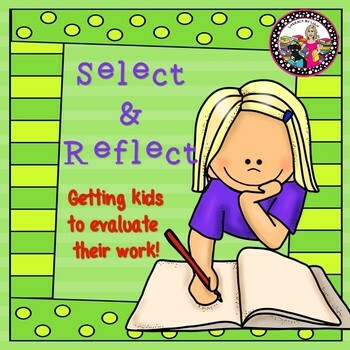 This would be especially useful if you have your kids complete a portfolio of their work. 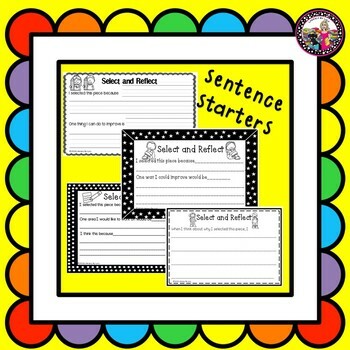 With seven different forms for all types of learners, you can teach all children to be reflective about their work. This is also a great way to share their thinking with parents. The completed form can be stapled to their work and sent home or used in a portfolio conference or displayed on a portfolio wall. A portfolio wall is a bulletin board divided into equal parts depending on the number of students in your class. This wall houses student work that your students select and evaluate to hang up. I have the kids decorate their “space” on the wall with pictures of their family and anything else that they can think of to personalize their space! This board remains a constant and the only thing that changes is the work and their evaluations! I let parents know ahead of time that work will come home in bulk, usually once a week or once every two weeks. I use a hanging folder for each child labeled with their name and this is where their work is stored once it has been graded or been given feedback by me. Usually, on Fridays, I hand each student their “portfolio” folder and they select and reflect on one piece of work to showcase. We have many discussions around how to select work and that we don’t just put up our best work but work that might show progress. This always allows EVERY child to participate and you will never have to worry about being equitable in what you are displaying! It’s genius! The forms are scaffolded for all learners, from kindergarten up. You might be interested in this Get-to-Know-You Activity where you can use the contents for decorating your portfolio wall if you take this direction! "A Bag Full of ME!"